Trainee Space Chef, the Space Golf Caper, the new comic by Alexi Conman and Cuttlefish. Maria is back with her latest crime-busting cosmic cookery comic adventure!!! The sporting spectacle of the upcoming galactic space golf tournament is the cause of much excitement - especially for the students of the prestigious Asimov-Ramsey Academy of Space-Catering, who have been allocated responsibility for providing refreshments to the players traversing the course across the moons of Epsilon-Gamma-12. Diligent Maria McMurdo and underachieving Norton Hollandaise are stationed on moon thirteen. Everything seems to be going well until the tournament is thrown into chaos by the revelation that a daring heist has occurred right under the noses of the organisers and space golf viewing public. TRAINEE SPACE CHEF: THE SPACE GOLF CAPER. Read it free online below. We are finally pleased to announce the release of the New Trainee Space Chef webcomic. From Alexi Conman and Cuttlefish, it is the long, long, long awaited sequal to the 2011 original. It's a sci-fi, crime and catering comic caper, that mixes sinister aliens, priceless jewelry, dubious cookery and golf. Read it online for free below. To view as full screen click on the little square icon in bottom right corner. 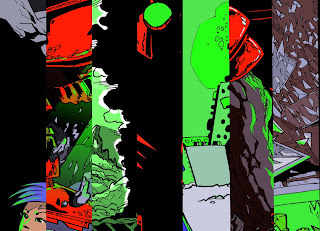 Here's a taster a comic which is coming to you soon. Scripted by Gordon Robinson and art by me, discussions are proceeding with the publisher. It's an dark, action packed strip in the best traditions of British comics. Will post again when we get more news. 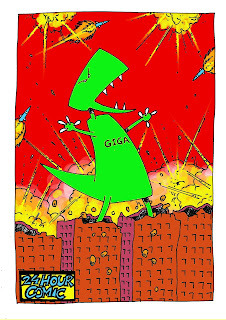 My Giga comic is now available to buy digitally on Comicsy. For a small fee you experience the joy of owning a digital masterpiece about a giant monster's quest to leave his life of violence behind.